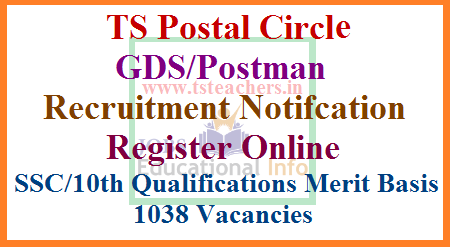 Indian Postal Department released Detailed Notification for the selection of GDS/Gramin Dak Sevak Postman Branch Post Master in Telangana Postal Circle for 1038 clear vacancies at all over Telangana Districts through Online Process with using Official links placed at www.indiapost.gov.in and www.appost.in Applications are invited by the respective appointing authorities as shown in the annexure ‘B’ against each post, from eligible candidates for the selection and engagement to the posts of Gramin Dak Sevaks under Telangana Postal Circle as listed in the Annexure. No weightage will be given for higher educational qualification. Only marks obtained in 10th standard of approved Boards aggregated percentage to the accuracy of 4 decimals will be the criteria for finalizing the selection. Passing of all the subjects as per the respective approved board norms is mandatory for taking candidate into account for calculating the merit. In case candidates get the same marks, the merit order would be taken as DOB(higher age as merit), ST female, SC female, OBC female, UR female, ST Male, SC Male, OBC male, UR male.